The impact of Darwin’s ideas on the intellectual life of France coincided with the emergence of Impressionist painting and its own turbulent public history. Darwin’s theories began to influence the instructional programme at leading art schools. 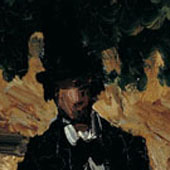 Several of the Impressionists read his books, and had friends in the scientific community who were prominent supporters. In the 1860s, one of Paul Cézanne’s closest friends was Antoine-Fortuné Marion (1846-1900), an aspiring painter who turned to paleontology and later became one of France’s leading Darwinists. 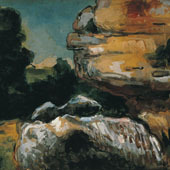 Cézanne’s fascination with the rock formations and ancient cultures of Provence owed much to Marion’s Darwinian notions and his fossil discoveries in the region of Mont Sainte-Victoire. Similarly, Claude Monet in his youth met Georges Clemenceau (1841-1929), the future statesman. 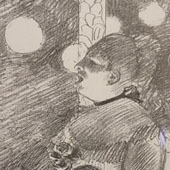 Clemenceau, whose early scientific writings were Darwinian, became a sympathetic friend and advocate for Monet’s art, and could relate it to evolutionary ideas. 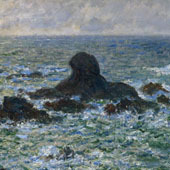 From the 1880s Monet himself repeatedly sought to paint ‘primal’ landscapes and seascapes whose geological formations offered startling proof of the great age of the earth; they were for him ‘marvellous impressions of the world’s dawn’. 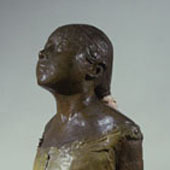 Edgar Degas, too, is known to have engaged directly with Darwinian theory, especially through reading Expression of the Emotions in Man and Animals soon after it was published in French in 1874. His images of dancers, singers, and criminals in the decades that followed stressed a kinship with animals in their features and gestures, and hinted at the possibility of human degeneration to an animal condition. Darwin’s theory of sexual selection encouraged the idea that abstract form and colour could be beautiful in themselves – an idea that chimed with the Impressionists’ approach to painting. Their perceived reliance on scientific theories of optics fuelled much of the negative criticism of their work. The apparently eccentric, nonnaturalistic colouring and the sketchiness of their paintings were often put down to a physiological problem of vision, such as colour blindness, and even compared to experimental colour therapies used at the time to treat psychological illness. Inevitably, their suspect artistic practices were tarred with the same moralistic brush as empirical science, and – like Darwin – they became linked to the atheistic philosophy of materialism. 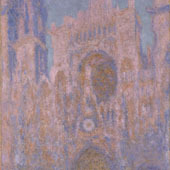 More favourable critics, like the poet Jules Laforgue, believed the Impressionists had – by looking analytically at natural and atmospheric effects – developed ‘the most advanced eye in human evolution’.